Your solar panel supplier will deny almost everything I write in this blog. They operate in a highly competitive market, however, where the price is often the deciding factor. No one talks about the differences in quality or the expected service life. A manufacturer's warranty that promises at least 80% output for 25 years is misleading. What factors lead to degradation of solar panel energy yield? The still relatively ‘young’ renewable energy market, which includes solar panels, wind energy, solar power stations (with parabolic mirrors), and biomass, is filled with hype and everyone is jumping on the bandwagon. This phenomenon affects every new market. When insulated glass came onto the market in the late '70s it was exactly the same story. Initially developed and manufactured by serious industries, soon everyone began making insulated glass ‘in their garage’. The result was overcapacity and sales prices that dropped dramatically, ultimately even falling below the cost price. In time the situation reaches equilibrium, once the balance between supply and demand is restored and only experienced companies continue production. The prices, however, never recover. The solar market is experiencing a similar evolution. Solar panels were invented back in the '60s, mainly for the aerospace industry. When, in 1963, President Kennedy declared the goal of ‘landing a man on the moon,’ which was accomplished in 1969, many innovative developments were required to achieve this, including solar power. It was only the increasing demand for renewable energy that truly enabled solar energy to break through in the international market in recent years. Yet the situation differs greatly from one country to the next. The Netherlands, for example, chose to invest in wind energy on a large scale, due in no small part to the lobby of civil engineering companies. While Germany, in addition to small-scale wind energy applications, chose solar panels for the largest part of its implemented sustainable power generation capacity. These are mounted both on private homes and in large power installations. The result is hectares full of solar energy. At our northern latitude (Netherlands, Germany) a space roughly the size of a football field (approx. 70x100m; 7000 m²) is needed to generate a megawatt (106 watts) of power. A standard panel measures approximately 1.6 m², so for 1 MW you need around 4500 panels. If you place 10 panels on your roof (depending on what is called the Wp or ‘watt peak’ capacity per panel) you have around 2500-3500 kWh per year. That is slightly less than the average annual consumption. Less than five years ago the installed cost of solar power was over €5.00/Wp. Now it is around €1.50/Wp. This makes it increasingly attractive to invest in solar panels. This price drop is mainly due to dumping by Chinese panel manufacturers. They are not all that concerned about quality, and unfortunately neither are the sellers who offer complete installations. Competition is mainly based on price, and the consumer is responsive to this. No one talks about the differences in quality or the expected service life. The latter, with a manufacturer's warranty promising at least 80% output for 25 years, is misleading, and the consumer assumes he will be able to achieve this yield throughout this period. In the past, even investors in large power plants failed to write specifications for solar panels and installations; they simply accepted the output ratings, taking their supplier/installer at his word. Today I am going to talk about the glass-related yield loss of solar panels, known as ‘potential induced degradation’ and abbreviated as PID. Glass is subject to corrosion. This is visible as white spots, which are the result of sodium and calcium migrating out of the glass. Solar panels are usually made of solar glass, which is prismatic/matt or matt/matt, and the composition of this glass makes it less susceptible to corrosion than normal flat glass. What factors lead to accelerated corrosion of glass? Voltage, heat, and humidity in the laminate of the panel result in electrolysis due to the practice of earthing the panels. This is mandatory for especially for large PV installations. Everyone is familiar with glass corrosion – just look at a drinking glass washed regularly in the dishwasher and you will eventually see the signs of minerals having been leached out of the glass. And how about glass shower doors? The signs of leaching are visible here too. This is due to a process we call ‘osmosis’ (which looks like this). A drop of water has a corrosive effect on glass, because it draws the calcium and sodium ions out of the glass and these remain behind on the glass surface as a speck of lime. This is in addition to the contamination of calcium deposits from the water. The lime spot caused by osmosis cannot be cleaned off and leads to permanent damage of the glass. In other words: In a solar panel covered with a sheet of glass, sodium is leached out of the glass, and we know that this affects the cells. To such a degree that PID can develop in very little time. This process is further intensified by factors such as moisture (osmosis), temperature (the panels can be up to 70 °C in the summer, and in a desert environment even >90 °C), and electrolysis that result from earthing the panels (which allows sodium to migrate out of the glass more quickly). What's more, everyone always denies that panels get dirty. What actually happens as they get dirty? The glass becomes less reflective and absorbs more heat from the sun, so the panels become warmer and less light enters. The direct result is a reduction of the yield. A major panel supplier, Bisol, recently published tests on this: cleaning resulted in a yield improvement of 4.73%. Consumers practically never clean them, because most panels are located on the roof where they are inaccessible. Large investors only spend money if the yield actually drops by 5%. But then the cleaning is usually only done with water, because municipalities are afraid the use of cleansers may contaminate the ground water and soil. There are basically two cleaning methods to choose from. The first is with a cleaner containing surfactants that encapsulate the dirt, after which the dirt is carried away with the rinse water. However, nowadays reverse osmosis water is also used (also known as demineralized water). 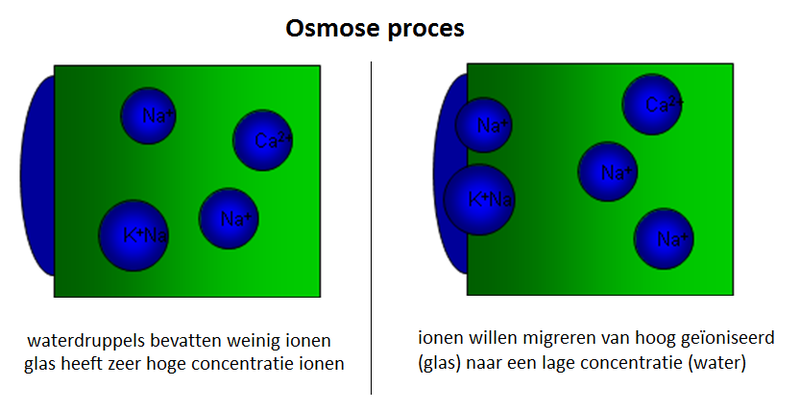 In this case the cleaning effect is achieved through ion exchange. Dirt is high ionized, and this water has a low ion concentration. Therefore the dirt is attracted to this water and is flushed off, but this also has a negative effect: the glass is damaged. Micro-scratches are formed in the surface, just as in the dishwasher. This also affects the back panel and even the aluminium frame. For the glass this means that one washing reduces the light transmission by about 1%. If cleaned once a year, which is recommendable, after 10 years 10% less light will enter the panel, what means a power yield reduction of at least 5%. The recommended solution is to prevent the glass-related causes of PID (for new panels) by coating the glass on the cells with a sodium barrier. In addition, cleaning can be reduced to a minimum through use of an antifouling coating that protects against environmental influences. Of great importance, however, is that the right coating is used. A coating changes the surface tension of the glass in one of two ways: it can be made hydrophobic (water repellent) or hydrophilic (water attracting). Research has shown that, when it comes to imparting antifouling properties, for vertical glazing there is no difference between hydrophobic- and hydrophilic-coated glass. New glass has a hydrophilic behaviour, but as it ages it gradually becomes more hydrophobic (due to corrosion). But for glass fitted at an incline or horizontally (e.g. on veranda roofs or atriums) the rate of contamination is higher for hydrophobic coatings than if it is not coated at all. This therefore also applies to solar panels. Long-term research demonstrated that the yield with a hydrophobic coating was actually much worse than with no coating at all. Companies that offer this type of coating as antifouling for solar panels should not be taken seriously. And when panel suppliers claim that their panels are coated this should raise serious doubts in your mind! New panels often have a hydrophobic behaviour (which is actually the opposite of what you want) because the profiles are sealed with silicone. This causes the surface behaviour to be temporarily hydrophobic, and after a few years more hydrophilic (the properties of the glass itself). Hydrophobic or hydrophilic – water droplet forming or water film forming respectively – expressed as contact angle. Your solar panel supplier will deny almost everything explained here, because they do not know much about the glass. They just want to sell you a panel and install it. And you have the manufacturer's warranty, right? The question remains as to whether it will still be honoured after so many years. And are you planning to fight for your rights in China? My advice: Buy from a renowned (e.g. Zonnekeur-certified) company that uses high quality (European) products, and not just the panel but everything needed for a complete installation (e.g. inverters). In this market, buying cheap will cost you in the long run, and it is time for the market players to ‘grow up’.